I also shared the fact that I was looking for two lower, small scaled chairs to face the sofa in our mostly neutral living room. And I recently found the perfect chairs which I want to share with you in todays post. If you follow me on Instagram then you have seen the chairs already but I haven’t posted them on my blog yet. 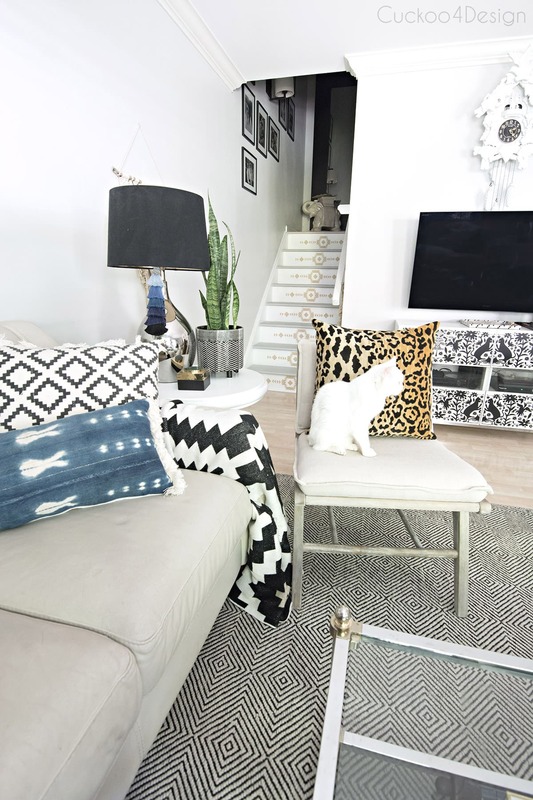 They give my living room a completely different look and I’m so happy with them and the fact that they are super affordable. So welcome to everyone coming from Brooke’s of Nesting With Grace. 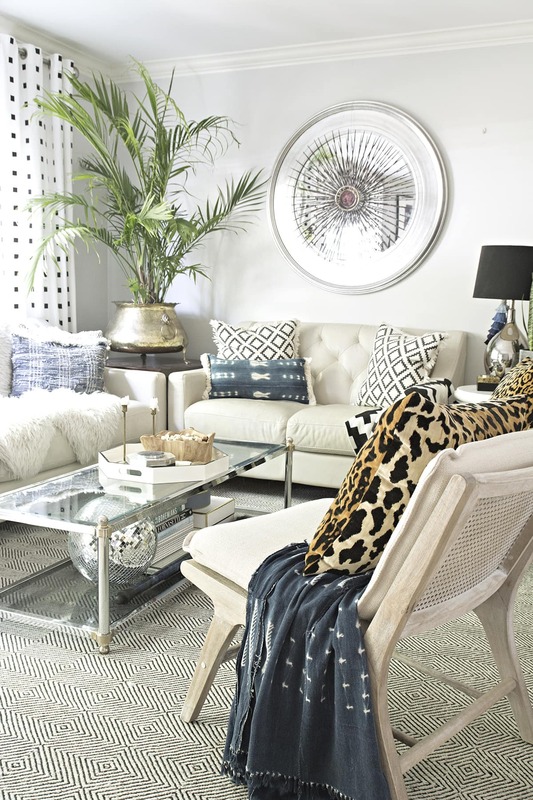 I just adore Brooke’s style and home. She’s always such an inspiration, don’t you agree? 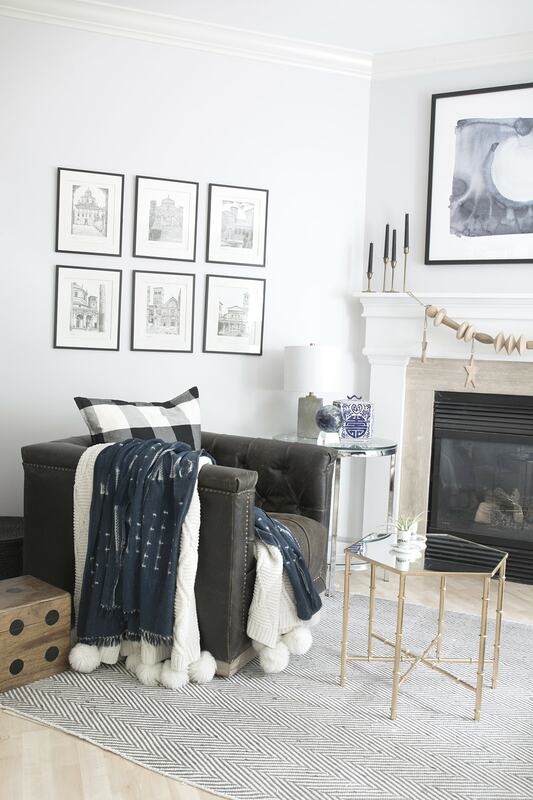 So let me introduce you to our new neutral living room chairs! They are EVERYTHING I have been looking for and I’m so glad that I returned all my other pieces of furniture I have tried in this room. You can see what I’m talking about in this post HERE. 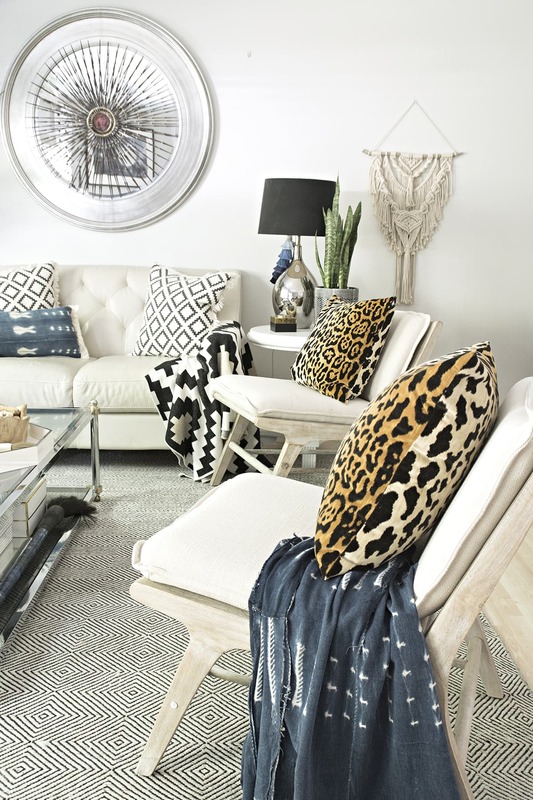 I love the cain back of the chairs, the weathered and whitewashed wood and the neutral fabric of the cushions. They fit right in and the backs aren’t too high because people sitting on the sofa can still see the TV behind the chairs. Willy agrees about the chairs and all cats are frequently found napping on them. A while back I shared my first macrame piece with you in this post HERE. Since then I made a new piece which I hung behind the end table and it was inspired by one of the pieces I included in my post. I really love making macrame and it reminds me of my childhood. It’s such a relaxing and fun craft. The other one is hanging on my kitchen hallway wall now as you can see below. You can also see that Maya is definitely interested in macrame as well and also my wide pant legs. Here is the other side of the room. It all flows so well now. And I’m happy to say that I wouldn’t change a thing! It feels so good when you 100% love the place you dwell in. Last week I shared my finished stairs with you (click HERE) which are right behind those chairs. Don’t they go well with the rest of the house now? I thinks o and we all love them. We switched things up a little in my daughter’s room too. She wanted me to take out the wool shag rug for the summer which I think was a great idea because she was starting to ruin the rug with her slime creations and I got sick of trying to keep it clean. Having your feet on the bare cool wood for summer is also much better. My daughter wanted to add a poster of her favorite show “Stranger Things” (HERE) which might not be the prettiest design decision but she loves it. And I have a summer yard update for you as well. 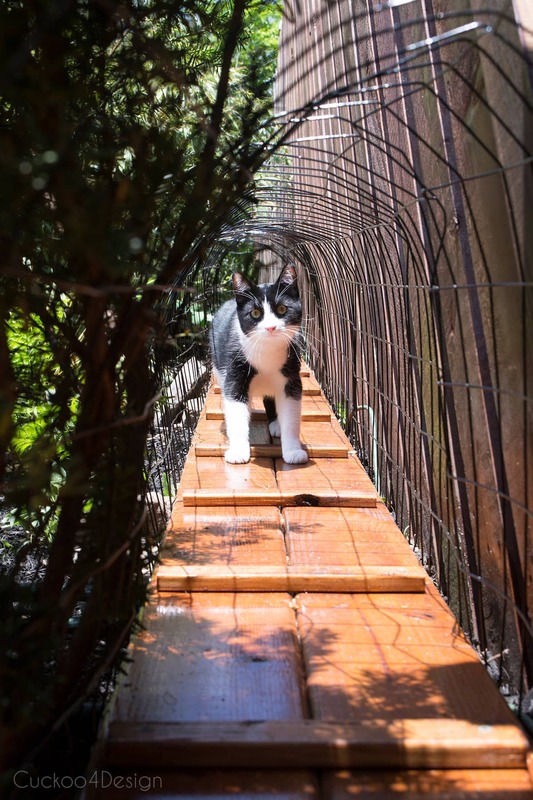 If you are new around here then you might not know about my cat enclosure (click HERE) and the fact that I recently extended it with a long tunnel (click HERE to see how to build you own). That tunnel didn’t lead to anything yet though. Last week I was able to build a little enclosure at the end of that tunnel that sits at the top of the hill under all the trees in our yard. And here is a little peak at the little cage when the cats first got to run up there. I didn’t take photos along the way about how I built it because I didn’t really know what I wanted or hot to build it. I didn’t have any plans I just went with the flow which probably isn’t the best idea. It all worked out well though and I might draw up the plans on how I built it and write a post about it that way. I planted a little ornamental grass inside the little cage because they love plants and the grass isn’t toxic to them and easy to maintain for us humans. 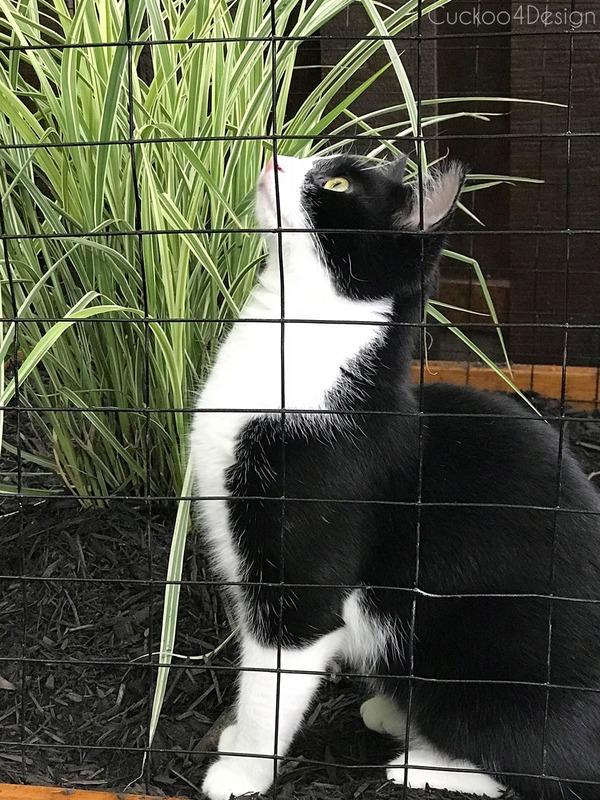 Here is little Willy mesmerized by the birds above him in the trees. I’m also glad he can’t kill all the birds that we also love so much. Oh and by the way, I have an awesome giveaway this week. Get there by clicking HERE! 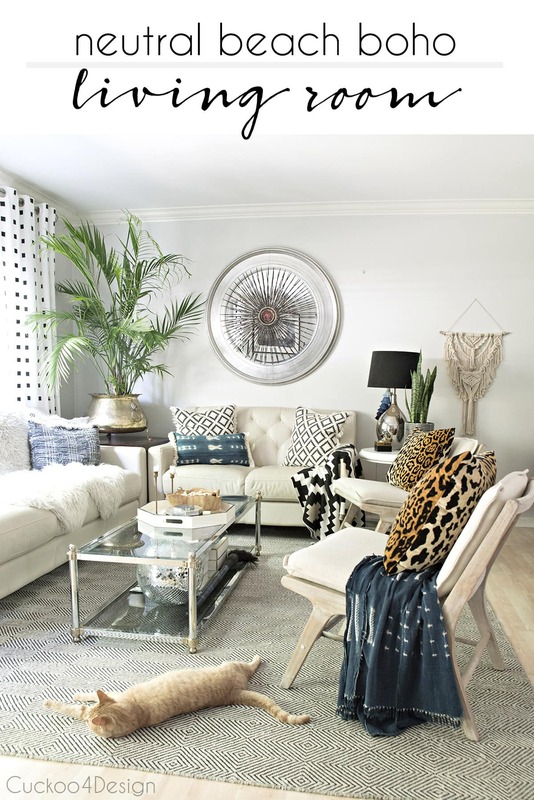 So now hop on over to the gorgeous home of my friend Rhoda’s of Southern Hospitality to continue with today’s home tour line up. after all that searching you finally have just the right chairs! Always one of my favorite stops on this tour! 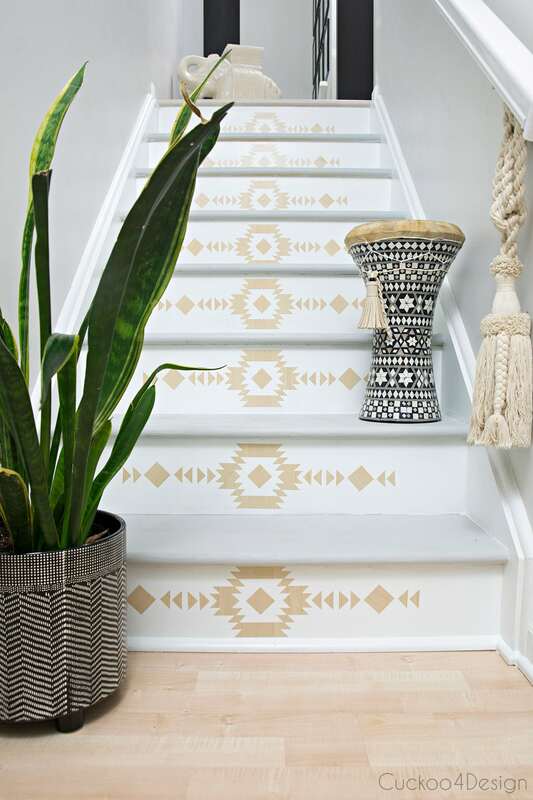 Your home is full of inspiration! I love those new chairs! They are perfect in your space and can’t believe the price!!! And, your macrame work is crazy good! Always love seeing Willy and Maya! Oh I do love your new chairs, they are perfect and those stairs are to die for. What a fabulous idea. Your tassel and macrame talent is unequaled for sure. I love your pretty hangings. I always love seeing your home and what you are doing next. You have such a talent for accessorizing. Thanks so much for joining the tours, always a thrill to visit. Thanks so much Marty, I just love making tassels. 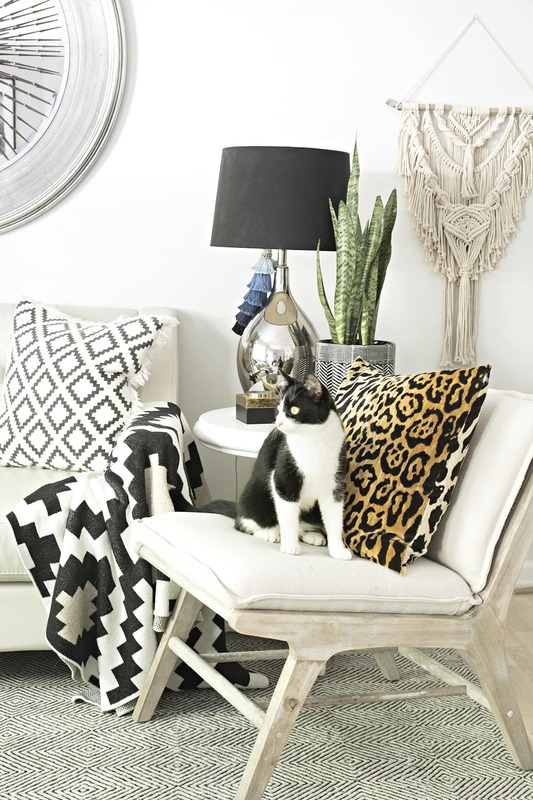 HI, Julia, your home is always inspirational and I love your black and white used as well. I have a bit of that in my house. Your cats look so happy out there in their run. And your new chairs look like a perfect fit for the living room. Fun to be on the tour with you today! Thanks Rhoda, I was so happy that I found those chairs. My granddaughter and I love Stranger Things. I got the Momopoly game of it at Target and we played it this weekend. So much fun! Oh I didn’t even know they had a Monopoly game for Stranger Things. That’s cool! Julia your chairs are perfect! I adore the staircase. The treatment on the risers is so lovely. Thanks so much Laura! I’m so glad that I finally tackled the project. I just love your style!! Your kitties are just precious! I love that enclosure that you made. Such a fabulous idea. We just had to put my 14 year old tabby to sleep last week. First time in my entire life that I haven’t had a cat. Going to give it sometime, but I’m sure I’ll get another maybe in the fall. I’m so sorry for your loss Christy. It’s so hard. And I can’t imagine living without a kitty now. After our 22 year old died I promised her that I’d give another shelter cat like her a chance and we went one week later and got another kitty. It just always makes me feel so terrible knowing how many of them waste away in shelters. Best of luck! Thanks so much Anita, I find it very addicting and just ordered more yarn today. I have nowhere to hang another piece but I feel like making more. I was going to say: how come I haven’t seen that staircase before! Well, now I know you just completed it and I’m in love!! And those chairs, wow, great price! I always enjoy touring your beautiful home! Wow! I always love touring your home, Julia. So glad you shared that staircase because it’s amazing! julia how amazing is the cat walk that you made. Love that…as I am sure they do as well. those chairs……and such a great price. Such a fun and funky house. Personally, I like the chair from Target much better than the original choice. This was a great post. You have such a cute house. 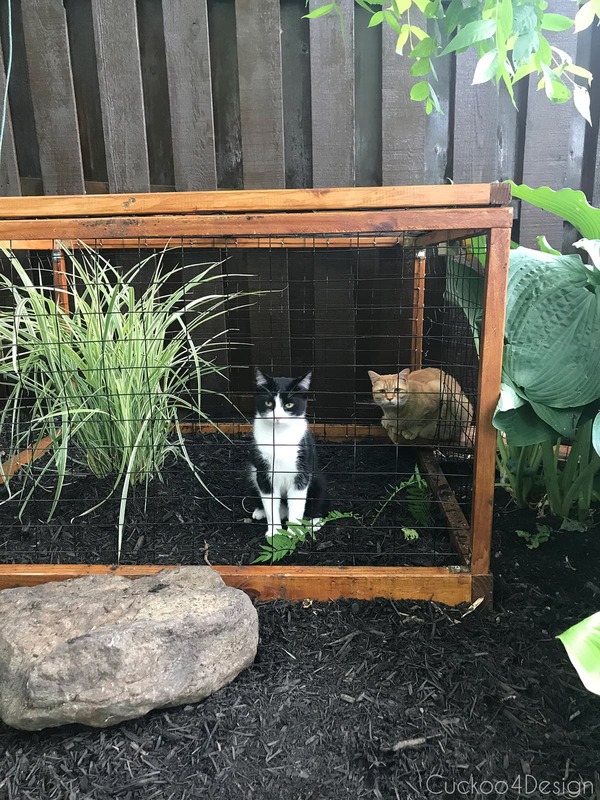 The cat cage is amazing. Great idea. I love, love the macrame hanger. My cat is jealous of your cats! That enclosure/obstacle course is amazing! And what a great score on the chairs–they’re perfect for the space and those cane backs are stunning. Happy Summer! Hi Julia! 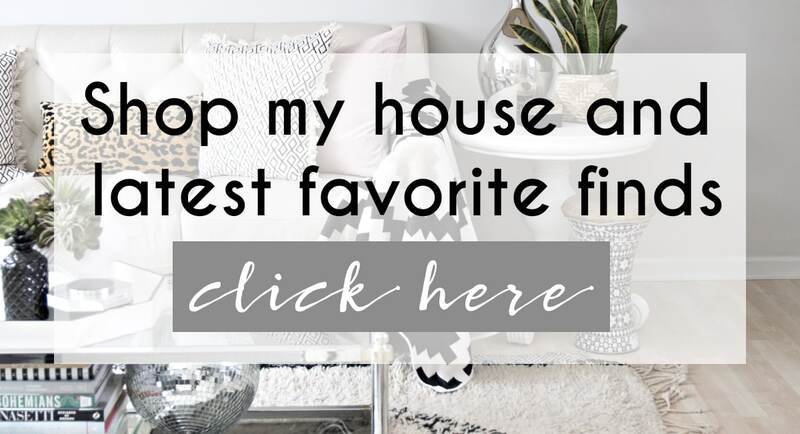 This is my first time visiting your blog so now I know straight where to come for hip and trendy decor ideas! I am totally loving all your pillows! 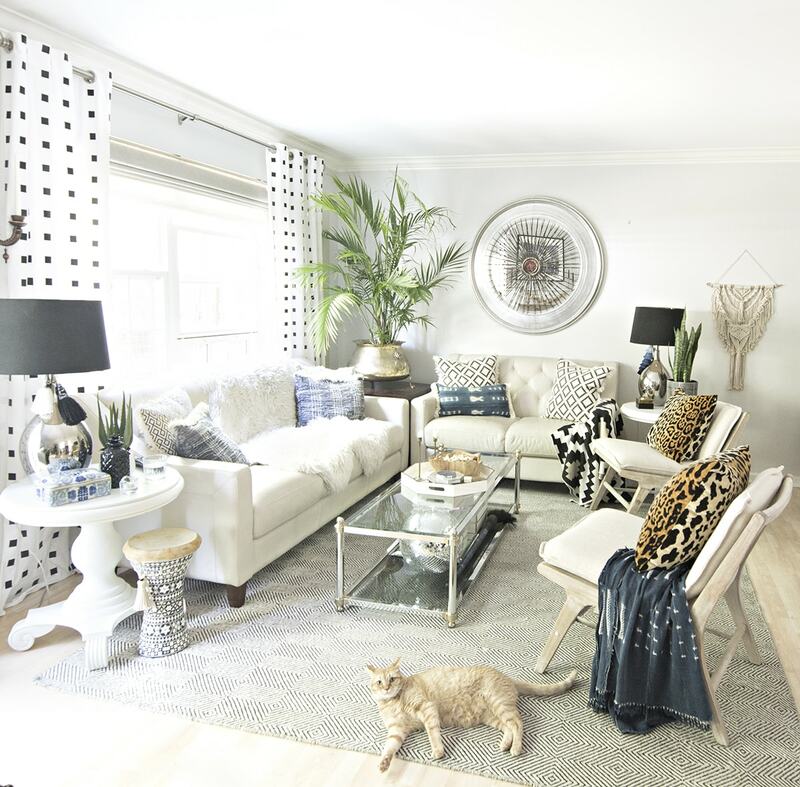 The animal print has always been a favorite of mine. As you saw today my style is vintage cottage with traditional, French country and farmhouse touches, but I totally love Boho too. 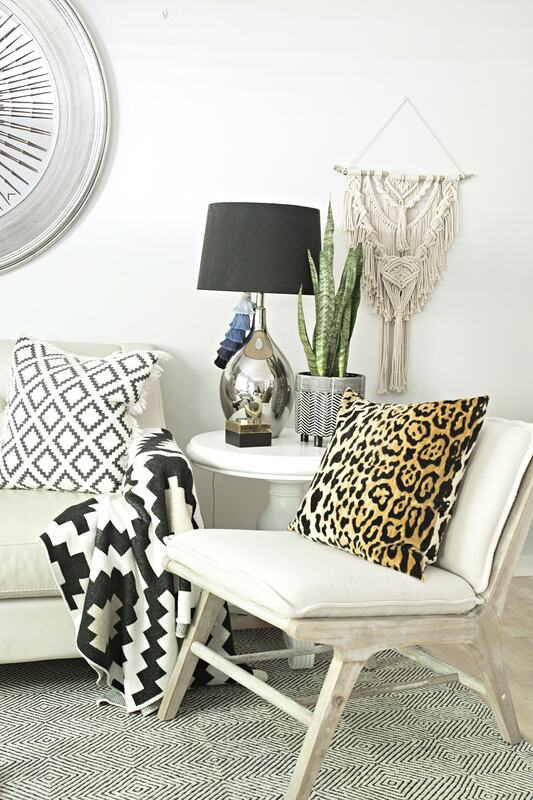 The easiest way I have found to add Boho style that will work in my home is with pillows and baskets and throws and you have so many awesome ones! I am definitely one to pick up on little design details that add character and personality, so I noticed your white Cuckoo clock right away which is a perfect little reference to your blog name. Do you collect them? That white one is amazing! So glad to meet you on this tour. Have a great summer! Wow thanks so much Amber! You just made my day with your comment. I’m from Germany and used to hate cuckoo clocks growing up. When I moved to the US in my early 20s my parents thought it was funny to gift me my first cuckoo clock as a joke. I wanted to paint that one white but my dad said no because it was so expensive. So I went out to find another one to paint which is the one in my living room. I found it on Craigslist for $20 and oddly enough it is from Korea not Germany, so I didn’t feel bad about painting it because it wasn’t an authentic one. It’s huge though and I love it. This started it all and was the reason for my blog name 😉 My daughter has one that is painted gold glitter. I think I was one of the first ones to paint them about 10 years ago and then they started popping up everywhere. Love it all, Julia! You looks so cute in that jumpsuit! Everything is just beautiful! I love how effortless you make it all look!